Can you sing, dance, tell jokes or perform mind bending magic tricks? Can you play a musical instrument or are in a group that loves to perform? 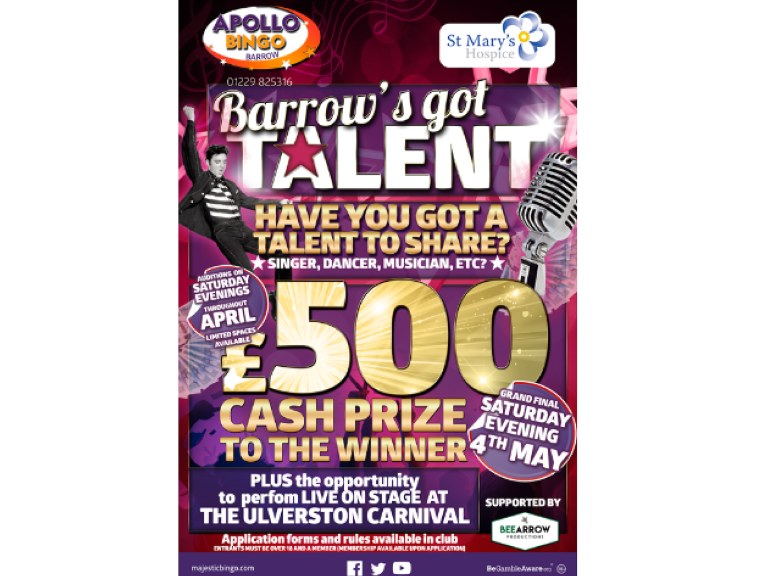 How would you like to share your talent and have the opportunity to not only win a £500 cash prize but to perform on stage at Ulverston Carnival too? It’s no secret that there’s plenty of talented people across Barrow and Furness, and with that in mind, Apollo Bingo are staging a fabulous fund raiser for St. Mary’s Hospice. So if you’ve got a talent so incredibly awesome it deserves to be shared, then Apollo Bingo Barrow would love you to come along and audition for their very first Barrow’s Got Talent show. You’re always in for a great night at Apollo, but Saturday evenings in April will be something really special. Auditions for Barrow’s Got Talent 2019 will take place every Saturday evening throughout April and provides the perfect platform for talented local people to perform their act in front of a live audience and panel of judges (we're thrilled to be have been asked to be on the panel). Acts that wow the judges the most win a place in the Grand Final on Saturday 4th May. All funds raised during the auditions and the grand final go straight to St. Mary’s Hospice to help them continue the amazing work they do in the community. You’ve got the talent, Apollo’s got the stage – all that’s left to do is to apply to take part. Don’t forget to tell everyone you know; friends, family, work colleagues about this event, and lets unearth some real talent.